* Option to made as phone dangler or key ring. *** All the additional option can be selected during your check-out process. 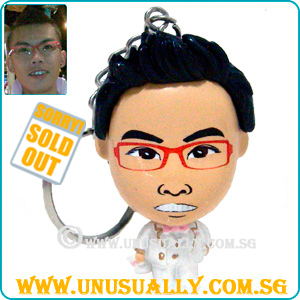 *** For custom caricature cartoon feel mini doll. Skin color will not be needed to be selected as we had only 1 standard skin color. *** As for the features, it will be in in-print style and not like 3D figurine in 3D hand-sculpted in polymer clay style, so we don't need any color selection for the skin color since we had only 1 color for such mini doll. * Pls take note, cartoon feel mini doll resemble will be in caricature cartoon feel style so if you are looking for real life style, than this is not the right product. You should order either the mini figurine or 3D figurine. * Mini doll will be in a more caricature cartoon feel finishing. * No proofing will be provided for mini dollies series. * Standard order will need ard 14 days upon submission of photo to us. * For express order or corporate bulk orders, please kindly contact us to discuss so that we can provide more accurate informations accordingly.